The industry isn’t a stranger to labor issues. Restaurants tend to have the worst employee retention rates in the U.S. A staggering 72.5 percent of people left jobs in food service or hospitality in 2017, according to the Bureau of Labor Statistics. Wingstop CEO Charlie Morrison has gone as far as cutting items from his restaurants’ menus in order to reduce the amount of labor it takes to make certain side dishes. “In 2018, one of the simple decisions that we made that proved very effective for us was the elimination of our three core side menu items, which had been with the brand a very long time,” Morrison said at the ICR Conference on Monday. Dave & Buster’s cut the number of items on its menu by 20 percent last February, hoping to speed up its kitchen. It will shave off a few more this February, CEO Brian Jenkins said during a panel at the ICR Conference on Tuesday. Technology is also a salve for retention issues. Shift One, a tech company that works with restaurants like Dave & Buster’s, Five Guys and Applebee’s, operates a mobile app platform that tracks employee progress and collects data like average check or items sold during a shift. Domino’s CEO Ritch Allison reiterated at ICR on Tuesday that his company has been working to give drivers less territory to cover by clustering more restaurants together. This makes their runs shorter, allowing them to make more deliveries in an hour and earn more tips. 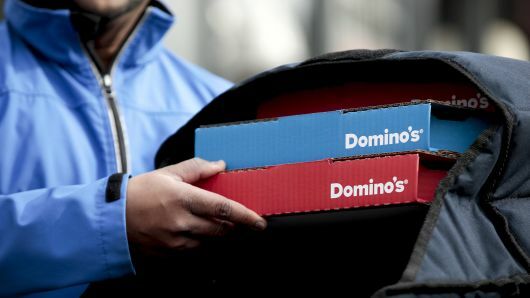 Better and more consistent tips can be a deciding factor for drivers to stay with a company like Domino’s rather than leaving for a rival, he said. “By and large wages are rising for all the right reasons and, overall, that’s a really good thing for Domino’s because nothing drives pizza sales more than people having jobs and having money in their pockets,” Allison told CNBC Tuesday. “It does create some challenges in terms of staffing, but frankly, it means we have to do a great job of attracting good talent, training them, giving them opportunities to grow and paying them well,” he said, adding 90 percent of Domino’s franchisees started as drivers and restaurant workers, Allison said.